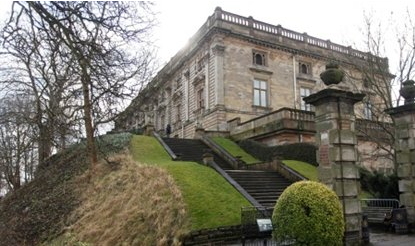 and I were in Nottingham and spent some time looking round Nottingham Castle. The original castle was built in 1068 and after being burnt down and redesigned over the centuries was converted into a museum and art gallery in 1875. 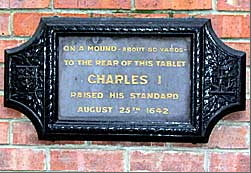 We walked around the grounds and came across a small plaque which claimed to mark the spot where the English Civil War had started in 1642 when King Charles 1 raised his flag and called for people to rally round him. This marked the start of a terrible chapter in English history as the country was divided over whether to follow the King or to support Parliament. Four years later it was all over – the King had been defeated and the Parliament forces had won. But I wonder how long the scars affected lives and families and communities, as divisions had to be healed and senses of betrayal had to be dealt with. Those who had been spies and informers would have tried to blend back into society while those who had suffered at their hands could easily have looked for revenge. And it made me think about something Jesus once said to those who were thinking about following him. These are words many of us do not often, or easily, associate with Jesus. And we need to recognise that elsewhere he speaks about the peace he came to bring and the peace he offers to his followers. So what was he saying here, what did he mean? It comes down to the question of loyalty – to whom are we loyal, who receives our greatest allegiance? In the Civil War, brothers who supported different sides in the conflict would still have been brothers but their allegiance to King or Parliament could have taken a higher priority and so the family would have been divided. And the point Jesus is making is that he is looking for that first place of allegiance, that primary loyalty, in those who call themselves his followers. For many Christians today, at least those living in the West, the choices are less stark. They can choose to follow Jesus and their families or friends may think they are strange but it doesn’t always cause bitter division (although sometimes it can). I have a friend who isn’t able to go back to his own country due to fears of what would happen to to him for being a Christian. I have another friend who was really concerned about how his family would respond when they learned that he had decided to commit himself to Jesus. For these people they had to answer the question of where their priorities lay and decided to follow Jesus while recognising the cost. But what about those of us who don’t experience the divisions and breakdown in relationships that Jesus speaks about? Does it sometimes result in us not living the lives he is calling us to live? These are hard, tough commitments but Jesus is totally serious in what he is calling for. Tom Wright, Matthew for Everyone, Part 1: Chapters 1-15, p.122. And there are many examples throughout history, and probably many examples we each know today, of people who are prepared to respond positively and joyfully to the call of Jesus and find the fullness of life which he came to bring. And there are many of us who are prepared to sit on the sidelines and watch such people as opposed to taking up the challenge for ourselves. If Jesus were to raise his flag in your street, in your place of work, in your church, amongst your friends how would you respond?